This is a winter version of my East Vancouver icon panorama scene. In this version, the sky has a little more grey, the graffiti is little brighter and a little angrier, and there is a little more to see of the chicken rendering plant. Meanwhile, the sky is starting to clear up over Grouse Mountain and the East Van cross glows against the darkness. Until now, after admiring your work. I love the cranes of the Vancouver Port. 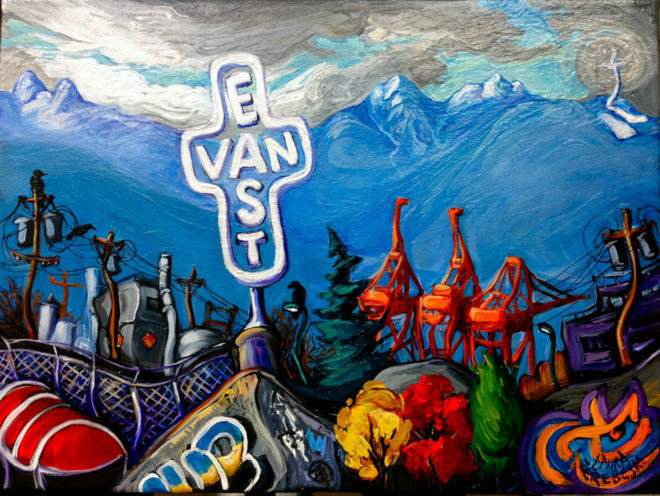 You made me proud of being part of East Van. Thank you, Minverva. This is one of the best comments I have ever read. I also love Frida Kahlo. I am interested in trying to purchase any of your East Van cross artwork for my friends 50th birthday. He is from East Van and loves your work. Do you have any small pieces available and if so could you let me know the cost? Thank you in advance. I’ve got a small DTES one but nothing with the East Van Cross at the moment.